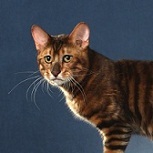 The first breeder outside of the US to have the amazing new Toyger cats. Toygers are designer cats. They have an easily trained character and are generally laid back, which makes them perfect for apartment dwellers. Their dramatic pattern and glittered pelt makes them very appealing to all of you who have ever dreamed of owning a real tiger, but because they are domestic, they are an absolute treasure to live with. Toyger cats are very intelligent, social and outgoing, so they do very well around all sorts of people and animals, they make great family pets. 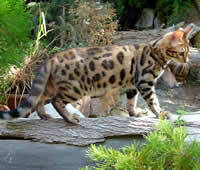 The Bengal breed originated as a human-made hybrid of the Asian Leopard Cat and the domestic cat. The Leopard Cat, (Felis Bengalensis), is a domestic sized cat inhabitant of Southern Asia and is thought to be one of the closest of the modern undomesticated cat species to the ancient common ancestor of the cat family. 'Keetso' is a najavo word meaning 'big footed'. We have been selecting cats with certain traits over the last few years for our Keetso program. Our aim is to develop a cat that resemebles the big cat look, by that we mean, big feet, bigger head, longer faces, inverted heart shaped muzzle, big noses, large and muscular build. The most imprortant thing however is temperament, we strive to produce sweet natured cats with loving personalities. We regularly have Bengal kittens and Toyger kittens available for showing, breeding and quality pets. We specialise in silver bengals and foundation bengals but also have stunning brown spotted/rosetted bengals and snow bengals . We are the first breeder outside of the US to have the amazing Toyger cats. We have been very lucky and have to have Bengal cats from some of the top US bloodlines, hence increasing the gene pool here in the UK. All our kittens are born in the home, mother and babies share our bedrooms. they are bred for not only for their stunning looks and wild type but also for their superb temperament. We now have kittens for sale! To see more photos, availablity and pricing.